This high relief, splash-minted coin exhibits the precision detail characteristic of such minting technique. Die struck out of thicker blanks, this coin will have a substantive feel to it as well. The coin is given an antique finish then enameled and baked for a beautiful and durable result. The reverse has space available for engraving. The Purple Heart is awarded in the name of the President to any member of an Armed Force who, while serving with the U.S. Armed Services has been wounded or killed. In 1782, Gen. George Washington established the Badge of Military Merit, a heart-shaped purple cloth or silk adornment conferred for singular achievement. Three were given — to Sergeants Daniel Bissell, William Brown, and Elijah Churchill. In 1932, President Herbert Hoover directed Gen. Douglas MacArthur to revive the award for Washington’s 200th birthday. This medal, designed by Elizabeth Will, keeps the color and shape directed by Washington, but adds the founding father’s image. MacArthur specified that it be issued to those wounded in combat (and earned the first one, retroactively). Official rolls are not kept; no one knows how many have been earned. 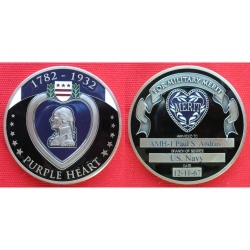 This coin honors the sacrifice — sometimes the ultimate sacrifice — paid by the men and women who are entitled to wear it.